Chef David Young's brûléed lamb chop with a blueberry hot sauce. 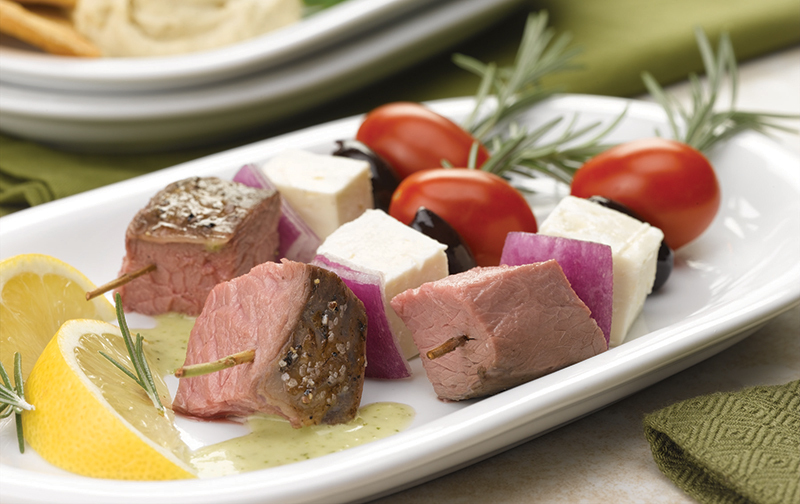 World flavors and elegant presentations make lamb the life of the party. Passed hors d’oeuvres, small plates, appetizers or the first course…whichever form it takes, that first bite sets the tone for any meal or celebration. A brûléed lamb chop with a blueberry hot sauce does just that for events by American Dining Creations. That adventurous side of lamb can be played up in a dramatic manner for small bites, and yet lamb isn’t always the first protein that comes to mind for appetizers. But chefs are certainly discovering lamb’s charms…it’s a meat that sets off world flavors and even comes with its own handle (the delicate, curving bone of a lamb chop). What’s more, it’s surprisingly economical. Executive Chef Brian Heddleston at the University of Montana points to lamb’s nutritional qualities as another plus. Here are some of the coolest ways Young, Maestro, Heddleston and other chefs are introducing lamb to their party guests. Lamb chop lollipops work so well at parties (thanks to that built-in handle) so guests can drink, eat and mingle gracefully. The lollipop is a small-plate signature for Taher Corporate Chef Matt Quist when something special, easy to eat and a little sophisticated is called for. Quist sears the elegant little lamb chops on a charcoal grill to the perfect rosy medium doneness. The lollipops are served on small plates on a bed of wheatberry salad with dried fruits for a subtle Mediterranean vibe. With an herby chimichurri sauce, ruby red pomegranate seeds and sprightly microgreens, “it’s colorful and festive,” Quist says. At American Dining Creations, Young’s creation of brûléed lamb lollipops are actually part of his latest surf-and-turf twist, paired with little bites of tuna tartare. The soft texture of the tuna makes a dynamic duo with the lamb with its shattering candy effect that gives way to fatty goodness. 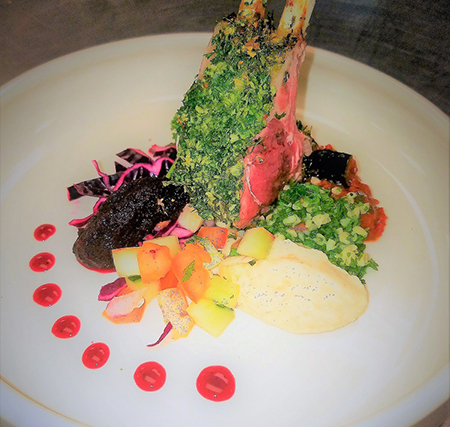 At Saint Andrew’s School, Maestro uses the lollipops as the anchor to an interesting sampler appetizer that’s a riff on classic lamb a la grecque (roast lamb, “in the Greek style,” a French lamb dish with Mediterranean ingredients like lemon, coriander, oregano and feta). Sumac-smoked lamb with a trio of eggplant conservas (very small side dishes in tapas bars in Spain and France) is part of a six-course dinner menu that’s on deck for a winter meeting of the Saint Andrew’s School Board. The trio is tabbouleh in one corner, citrus pickled cabbage nestled next to it and a jewel-toned roasted beet emulsion rounding out the vibrant, flavor-forward plate. “Lamb is available in various levels of gaminess, so it’s a great item to incorporate along with some acidic, fresh side items like salads, grains, dressings or fresh vegetables to complement the strong flavors of the lamb,” Maestro says. Greek flavors absolutely go well with lamb, but why stop there? 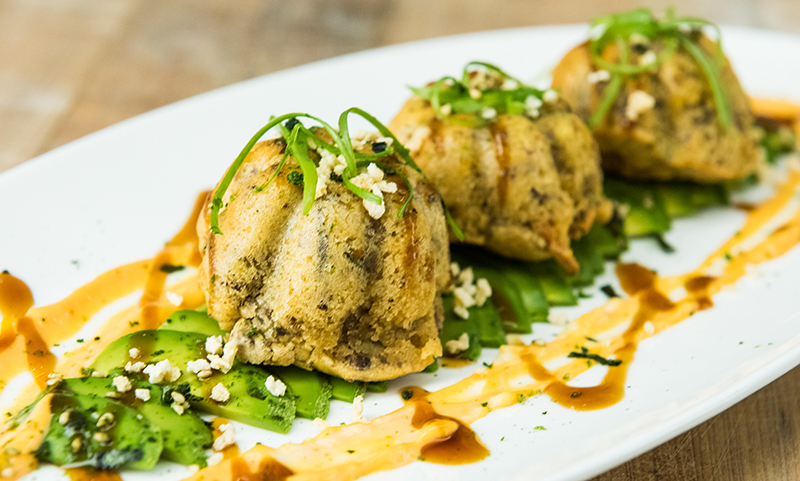 “Over the last few years, there’s definitely been a rise in interest in ethnic food,” says Jill Flores, sous chef at Montana State University’s (MSU) Miller Hall. Flores has been exploring curry in general, and started making rogan josh, a Persian sauce with warm, spicy flavors, as a sauce for rice bowls and then as lamb rogan josh. After trying other curry sauces, rogan josh came out ahead for Flores, “as it’s delicious, easy to make and seems to be liked by a wide variety of people,” she says. Asian flavors also work well. Okonomiyaki is a savory Japanese pancake whose name means “how you like” (okonomi) and “grill” (yaki). Executive Chef Jose Martinez of Cal Dining at the University of California at Berkeley experiments with Japanese food frequently, adjusting precise, time-honored techniques to work with big-volume cooking. Traditionally, okonomiyaki pancakes are made to order on a grill, but Martinez turned them into puffs that can be made ahead of time in large batches. Batter for the puffs is made with flour, dashi, eggs and baking powder and poured into fluted muffin tins. Each puff gets a small scoop of ground lamb on top and then another layer of batter. The ground lamb’s wild flavor in the puffs meets flavors that bring out its wild side: onions, garlic, curry, paprika and cayenne. Now, the puffs can be baked before getting dressed up with thin slices of avocado, nori, mayo and soy glaze. Lamb can be Italian, too. 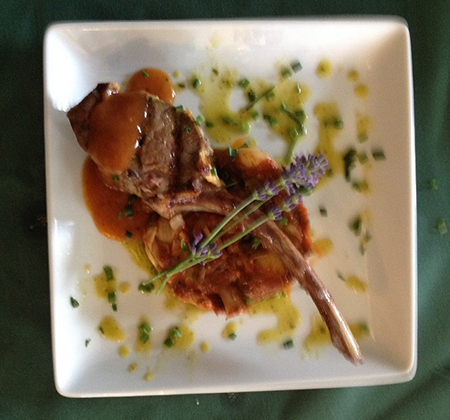 At a recent faculty event at Marianapolis Preparatory School in Thompson, Conn., the Sage dining team served a very pretty plate of herb-crusted lamb chop on a Tuscan bean ragout with chive oil and thyme blossoms. Middle Eastern kebabs and small lamb ribs spiced with sumac are other flavorful detours for lamb. 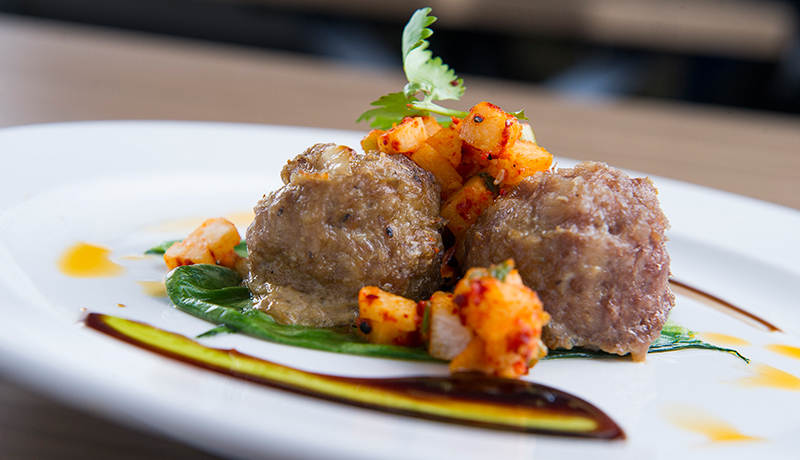 Kofta, a dish where ground lamb is combined with aromatics, is popular all over the Middle East, and at the University of Montana, where Heddlesten makes lamb kofta as an appetizer, forming the mixture into meatballs that are spiced with dukkah and skewered. Dukkah is an Egyptian spice blend—containing coriander, cumin, hazelnuts, sesame seeds and mint—that’s especially well suited to the flavors of lamb. And at Montana State, lamb meatballs bring it all home to an American creation, party meatballs with jalapeño jelly and barbecue sauce, a take on the classic 1970s dish that uses grape jelly, barbecue sauce and a crock pot. This shows that you can truly take lamb anywhere. Montana State University’s local food purchasing program, Farm to Campus, has succeeded in making more than 20 percent of food purchased locally. In fiscal year 2016, MSU’s Farm to Campus purchases totaled more than $1.5 million, according to Kara Landolfi, MSU’s Farm to Campus coordinator. One of the biggest wins for the program has been the purchase of 30 lambs that are raised and finished by the MSU college of agriculture’s department of animal and range sciences. The lambs were purchased through a partnership between MSU Culinary Services and the ag department.